Iron levels in the body depend on diet and its absorption. If the iron levels in the blood drop, it means that the hemoglobin levels are less and treatment is necessary. 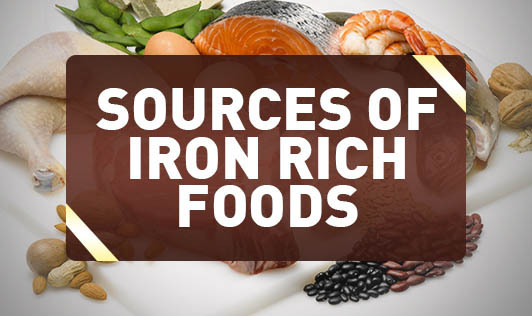 Non - vegetarian iron rich food sources are many compared to vegetarian food sources. A person who is overweight has to consume non-vegetarian iron sources in a limited quantity so their weight too is under control. 1. Brussels sprouts: Serving Size (1/2 cup), 0.9 milligrams of iron (5% DV). 2. Raisins: Serving Size (1/2 cup, packed), 1.6 milligrams of iron (9% DV). 4. Dried Peach: Serving Size (1/4 cup), 1.6 milligrams of iron (9% DV). 5. Pumpkin Seeds: Serving Size (1 ounce, about a handful), 0.9 milligrams of iron (5% DV). Though these foods are listed, contact your dietitian to know different cooking methods and recipes. You can send us a recipe and we will tell you how to make it iron rich! Go to "Tools --> recipe makeover", and write to us.